In this program, we will provide you practical and unique education and research experience of the highest quality in human security engineering. Also, various financial aids are available to support you. Post-doctoral fellow positions are available for this COE program. We welcome outstanding researchers in related fields. This program will accept 20 students annually. You have to pass both of the entrance exam to one of the four engineering departments (Environmental Engineering, Civil and Earth Resources Engineering, Urban Management, or Architecture and Architectural Engineering) or the Graduate School of the Global Environmental Studies organizing this program and this GCOE program's own exam. In the latter exam, your project proposal is evaluated. 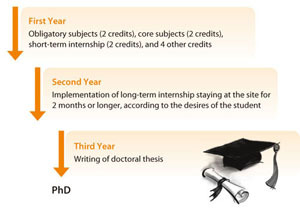 Each department/graduate school has an admission system for working students. Staff of educational or research institutes such as universities or advanced practitioners in local/central government or international organizations.